Libra and Pisces are an interesting but complex union in which the former are a "anaconda", and the latter are a "rabbit". Why is this happening? Signs belong to the elements that are not friendly in nature — air and water, respectively. If the water can not affect the air masses in any way, a slight wind blow is capable of raising a small ripple on the water surface, and a strong hurricane will lead to a storm. Representatives of Libra are kind, gentle people who conquer the hearts of others with their charm and ease of communication. Thus, they aspire to freedom both external, and internal. They like the good attitude of others, but they themselves are not in a hurry to get attached and depend on someone. All is different with Pisces. They, on the contrary, seek spiritual affinity and mutual trust with a partner, and they will suffer without receiving it. In relations with Libra, this is exactly what happens. Pisces are looking for ideal relationships in any field and expecting from the partner very much. The element of air attracts them with their optimism and kindness, good upbringing and enchanting charm. Both signs of the zodiac tend to balance, but constantly doubt themselves. The Libra is always facing a choice, any, even the simplest action, provokes an internal dispute: it is difficult for them to decide which cup is outweighed. The element of water often experiences something like this: the contradictory nature forces it to rush from side to side, which is clearly visible in the image of the sign itself: two fish floating in different directions. The indecisiveness of both affects their character in such a way that both look for a partner stronger than them, at the expense of which one can solve their problems and feel protected. This fact reduces the chances for successful relationships and good compatibility of Libra and Pisces. First sign led by Venus — the goddess of love, beauty and fertility. Her ward strives to create and create, has a soft nature and lightness, which is present in his life: in this connection, he literally gets everything, for whatever he undertakes. Such luck attracts Pisces: they see in the partner someone who can ease their difficult existence. Overcoming of obstacles is given to them not so smoothly, as to the partner, therefore they clearly see the benefit in this union. Libra, in turn, in spite of their spiritual simplicity, are sufficiently far-sighted and also know how to calculate profits. Seeing that the partner emotionally depends on them, they skillfully use this for their own purposes. Their independence and mysticism, which the Pisces paint in their head, will always draw a sign of water, but they will not receive the same kind of worship. It is controlled by Neptune, endowing him with kindness, a desire to help others, mercy and empathy. These qualities are similar to those of a partner, so they are attracted to each other. The Horoscope of compatibility of Libra with Pisces promises them a specific relationship in which the first will receive almost everything, and the second will periodically suffer from a lack of emotions and the coldness of the partner. Compatibility of Libra and Pisces in business and at work is quite successful: two creative people perform even the usual work in the most interesting way. They work well as colleagues or companions, the boss role foe them should be avoided. This is due to their freedom and laxity: everyone can dream and forget about important things. Therefore, they need a good leader, skillfully directing their activities in the right direction. The successful compatibility of Libra with Pisces in friendship is hardly possible. This is due to the fact that the representative of the air for all the inner emotionality is always closed to the interlocutor. Pisces is sensitive and can not trust such a friend completely. Therefore, they only have a friendship, in which they can be to each other interesting interlocutors or to benefit from each other. Compatibility of Libra and Pisces in love will be favorable only if they are strongly interested in each other and want to build relationships, despite the emerging difficulties. In this partner will help good-naturedness and sensitivity, as well as the ability to take the place of another. Originally representatives of signs see in the beloved the ideal: rich imagination of both attributes to the elect those qualities which actually are not present. Eyes of both will open later, when passions will subside. The Libras are excessively sociable, and their partner carefully chooses his environment: this fact often becomes the reason for disagreements. The sign of water is jealous and makes a complaint in this regard. The ward of Venus does not tolerate criticism, conflicts and negativity of any kind. The dissatisfied look of the partner will depress him. Also, Libra will be burdened by the fact that the lover places a lot of hope on him, and therefore responsibility, which the air element perceives as a restriction of freedom and in every way tries to avoid. Gradually, their couple will settle irritability and despondency. Both have a subtle spiritual organization and are therefore easily wounded. If they take this into account, treat each other carefully and gently, they can build a comfortable relationship. On the other hand, the silence of their grievances and claims will only lead to an increase in discontent. They need a golden mean, when both partners are sufficiently tactful, but completely honest. Good compatibility of Libra with Pisces in a relationship is possible if both are mature and experienced personalities. Young representatives of signs are too emotional and have not yet acquired spiritual stability. But the compatibility of Libra and Pisces in bed is an object for the envy of other people. They are gentle, caring and romantic: they do not tolerate rudeness. For them, a sexual act is a whole art, where everyone wants to show their abilities. Due to their creative thinking, boredom and monotony are not threatened by them. They constantly come up with something new and gladly agree to such proposals each other. In intimate relationships, partners strive to reveal all their sensuality, to experience all sorts of emotions and pleasant sensations. 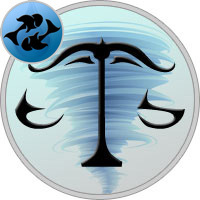 Pisces are trying their best to please the partner that the latter may like, but often annoy, as the full subordination of the partner automatically makes Libra a leader and imposes on him the notorious responsibility. Compatibility of Libra with Pisces in marriage is very difficult because the water sign is too emotional, and its mood can change too often. The partner is heavy with such swings, and he is pretty tired. From the soon break they are rescued by the fact that both do not like scandals, and when the situation is heated, the spouses are hurrying to leave the battlefield. Cooled down in different directions, they again reconcile, not remembering the causes of the incident. Such interaction leads to the fact that mutual claims are being pinched, increasing the likelihood of a big bang in the future. To save the marriage and raise the level of compatibility of Libra and Pisces in family life, they need to learn to listen to each other, solving misunderstandings on the spot, rather than hiding in a world of illusions. They also have to identify, voice, and most importantly, accept personal responsibility, which they usually throw at each other, like a ball in the game. This is done through the distribution of roles and responsibilities of spouses in the family, as well as the establishment of order and rules, which should be adhered to by both. Otherwise, their chances for a long and happy life are zero.